This article is about the Myers-Briggs personality type. For the Socionics ESTj, see Logical Sensory Extrovert. ESTJ (Extraversion, Sensing, Thinking, Judgment) is an abbreviation used in the publications of the Myers-Briggs Type Indicator (MBTI) to refer to one of sixteen personality types. The MBTI assessment was developed from the work of prominent psychiatrist Carl G. Jung in his book Psychological Types. Jung proposed a psychological typology based on the theories of cognitive functions that he developed through his clinical observations. From Jung's work, others developed psychological typologies. Jungian personality assessments include the MBTI assessment, developed by Isabel Briggs Myers and Katharine Cook Briggs, and the Keirsey Temperament Sorter, developed by David Keirsey. Keirsey referred to ESTJs as Supervisors, one of the four types belonging to the temperament he called the Guardian. ESTJs account for about 8–12% of the population. E – Extraversion preferred to introversion: ESTJs often feel motivated by their interaction with people. They tend to enjoy a wide circle of acquaintances, and they gain energy in social situations (whereas introverts expend energy). S – Sensing preferred to intuition: ESTJs tend to be more concrete than abstract. They focus their attention on the details rather than the big picture, and on immediate realities rather than future possibilities. T – Thinking preferred to feeling: ESTJs tend to value objective criteria above personal preference. When making decisions, they generally give more weight to logic than to social considerations. J – Judgment preferred to perception: ESTJs tend to plan their activities and make decisions early. They derive a sense of control through predictability. ESTJs are practical, realistic, and matter-of-fact, with a natural head for business or mechanics. Though they are not interested in subjects they see no use for, they can apply themselves when necessary. They like to organize and run activities. ESTJs make good administrators, especially if they remember to consider others feelings and points of view, which they often dismiss. According to Keirsey, ESTJs are civic-minded individuals who dedicate themselves to maintaining the institutions behind a smooth-running society. They are defenders of the status quo and strong believers in rules and procedures. ESTJs are outgoing and do not hesitate to communicate their opinions and expectations to others. According to Linda V. Berens' Interaction Styles model, ESTJs fall into the "In Charge" style, being both "extraverted" (E) and "Directing" (ST). They are outgoing, yet task-oriented, which also explains the behavior described above. Te organizes and schedules ideas and the environment to ensure the efficient, productive pursuit of objectives. Te seeks logical explanations for actions, events, and conclusions, looking for faulty reasoning and lapses in sequence. The dominant Te means ESTJs use logical fact-based judgments in the outer world of people and actions. This again explains their behavior and leadership qualities. Si collects data in the present moment and compares it with past experiences, a process that sometimes evokes the feelings associated with memory, as if the subject were reliving it. Seeking to protect what is familiar, Si draws upon history to form goals and expectations about what will happen in the future. The auxiliary Si's connection with memory and familiarity leads ESTJs to defend the status quo and procedures. Ne finds and interprets hidden meanings, using “what if” questions to explore alternatives, allowing multiple possibilities to coexist. This imaginative play weaves together insights and experiences from various sources to form a new whole, which can then become a catalyst to action. Ne's use of abstract perception in the outer world gives ESTJs the ability to conceptualize. However, Ne is subservient to the inward, concrete focus of Si. Fi filters information based on interpretations of worth, forming judgments according to criteria that are often intangible. Fi constantly balances an internal set of values such as harmony and authenticity. Attuned to subtle distinctions, Fi innately senses what is true and what is false in a situation. With Fi in the inferior position, some ESTJs may not make full use of Fi's associations with kinship, personal connections, and congruency of values or beliefs. Introverted thinking (Ti): Ti seeks precision, such as the exact word to express an idea. It notices the minute distinctions that define the essence of things, then analyzes and classifies them. Ti examines all sides of an issue, looking to solve problems while minimizing effort and risk. It uses models to root out logical inconsistency. 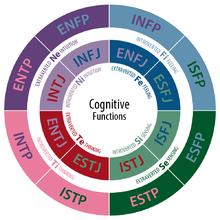 For the ESTJ, Ti supports Te by expanding the use of the Thinking function. But using Ti requires more effort, and Ti's application is narrower. ^ "Keirsey.com Portrait of the Supervisor". Retrieved 10 January 2010. ^ a b Barron-Tieger, Barbara; Tieger, Paul D. (1995). Do what you are: discover the perfect career for you through the secrets of personality type. Boston: Little, Brown. ISBN 0-316-84522-1.